The health benefits of caffeine range from physical alertness and treating migraines to keeping our heart healthy and improving our memory. However, the benefits do not stop there. Coffee and caffeine can help our skin as well. Caffeine can tighten skin, smooth puffiness, fight free radicals, and reduce dark under eye circles. It’s fairly common to come across an eye cream infused with coffee due to all of these amazing benefits. 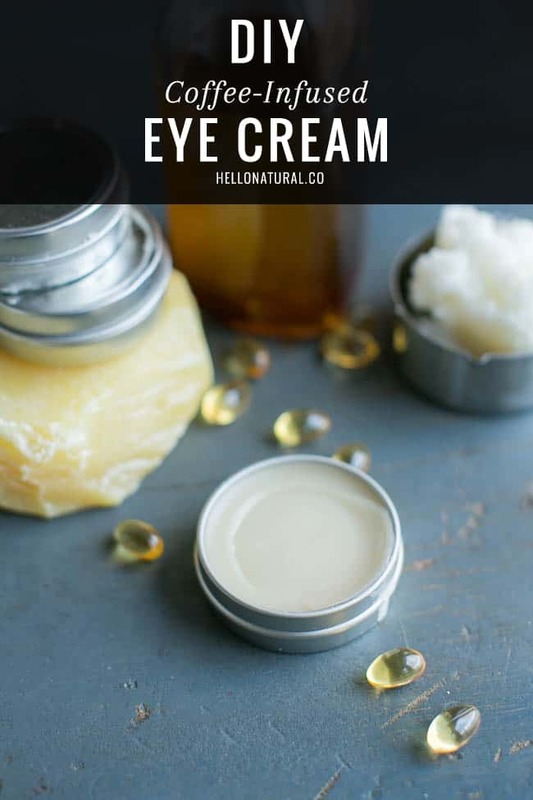 But you don’t have splurge on expensive products when you can easily make your own coffee-infused eye cream at home! 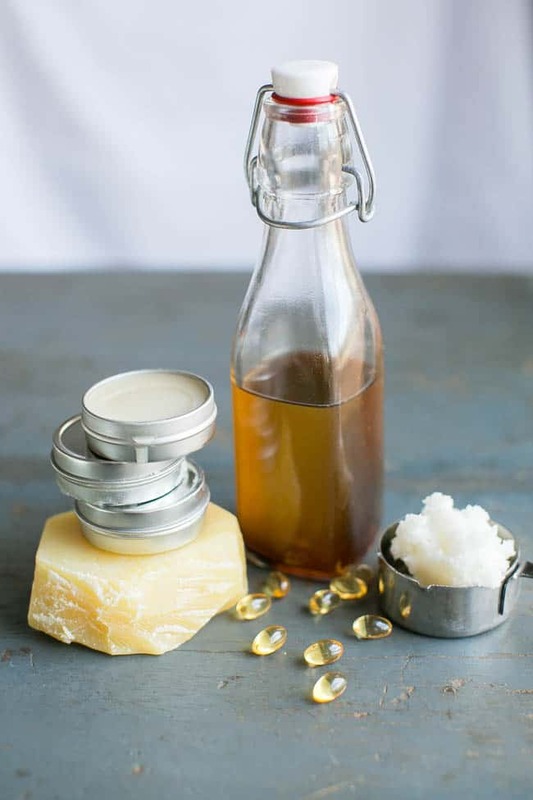 Place beeswax in a glass bowl and submerge in a larger pot of water on low heat. When the beeswax is melted, add in the coffee infused oil, coconut oil, jojoba oil and vitamin e oil, stirring as you add each ingredient. Remove from heat and add 4-5 drops of chamomile essential oil, mix. Transfer to a storage container, or into small tin containers. Place container(s) in the refrigerator to solidify. You can keep this cream in the refrigerator since the cool temperature is also key to reducing under eye puffiness. I love using coconut oil but is there a different oil/butter I could use? I still have avocado, cocoa and shea at home. Would it be possible to use one of them? milia under the eyes ? I was wondering the same, I have a stock of essential oils now and I don’t want to buy a new one every time I try a new recipe. Can I substitute ? I enjoyed this post on Pinterest, but was saddened by the fact that organic coffee was not stressed since coffee is one of the most highly sprayed pesticide crops there are! Is it possible that there is some information missing about the jojoba oil? I can’t find the amount necessary for the cream. Thanks! Sorry, that should be 1 teaspoon, thanks for alerting us! how much vitamin e oil do you think is in the three pills? I have a bottle of vitamin e.
I would say a quarter teaspoon. Without the beeswax you probably won’t get it to solidify much at all. I would check around locally for some beeswax substitutes like another natural wax to help with the hardening process. I found 1 ounce chunks of beeswax at the local “Health Hutt” for about $1 each. Where’s the link to the coffee infused oil tutorial? Does this really work? I have a coffee infused eye cream that I paid a lot for and I don’t feel like any that I’ve tried actually do something about fine lines. I’ve found dark circles are one of the most stubborn things to treat as an esthetician, so much of dark circles have to do with genetics. Fine lines are also hard to treat, but I’ve found not quite as difficult. With prolonged consistent use of an eye cream, improvement can be made. A lot has to do with how much damage there is from the sun, and the elasticity in the skin. There is no miracle cream for wrinkles, but there are definite benefits to keeping the eye area hydrated, and it can make a difference. I notice a significant difference when clients start using eye creams versus those that do not. And I’ve found that coffee used topically does help, although temporary, it helps! So keep trying or maybe switch to a different eye cream, some are more emollient than others, and pay attention to the active ingredient! Hope this helps.